"Why Finnish babies sleep in cardboard boxes"
Click here to view the entire BBC article on the BBC's website. 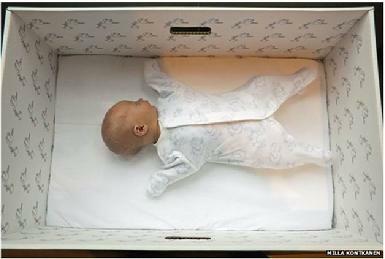 "For 75 years, Finland's expectant mothers have been given a box by the state. It's like a starter kit of clothes, sheets and toys that can even be used as a bed. And some say it helped Finland achieve one of the world's lowest infant mortality rates. 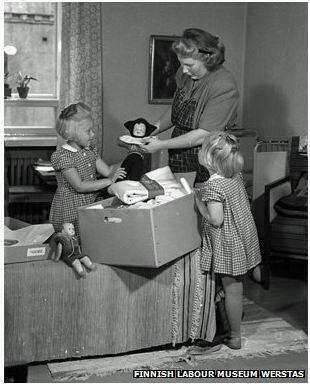 It's a tradition that dates back to the 1930s and it's designed to give all children in Finland, no matter what background they're from, an equal start in life. The maternity package - a gift from the government - is available to all expectant mothers. It contains bodysuits, a sleeping bag, outdoor gear, bathing products for the baby, as well as nappies, bedding and a small mattress." Click on the above link to read the entire article at the BBC's website.